They’re young, savvy and in charge. Prepare yourself for a different kind of consumer. Imagine yourself at a job interview; you’re more nervous than you’d like to admit. You’ve heard a lot about your potential employer, some bad but mostly good. You’re hopeful because you’ve done this before. This should be a breeze. As you look around the room jovially, a group of people walks in. You stand up and smile, take a deep breath and brace yourself for introductions. They give you one swift glance and walk out—they’re not interested. Welcome to the world of Generation Z where you have less than ten seconds to impress or be forgotten. Young, resourceful and savvy, this generation will soon be courted by every brand under the sun. By 2020, Generation Z will represent 24% Of the U.S. workforce and 40% of consumer spending. With that kind of clout, this generation will be the most lucrative one to date. Unlike their daydreaming and aspirational predecessors, Generation Z are demanding and impatient. They don’t whine, they simply move on. Using up to five screens daily, they process information at a quicker rate than their older counterparts, preferring to communicate through images rather than text. Having more in common with Baby Boomers than Millennials, Gen Z is coming of age in a time of turmoil. They’re growing up during an economic recession, a world afflicted by war, climate change and racial tensions. As a result, the post 9/11 generation live their lives cautiously and sensibly. All these factors have made them more open-minded, outspoken and compassionate than older generations. A new era is upon us. Hasta la vista, Millennials, there’s a new golden child in town. Generation Z has completely different expectations and buying habits than previous demographics. As digital natives, they’re no-nonsense consumers accustomed to immediacy and efficiency. This generation is desensitized to branded content, as they themselves are, in essence, brands—having shared countless curated selfies online. Hungry for original content, they love to consume but more importantly share new and exciting findings. Questioning and distrustful of brands, (source) Gen Z almost always pushes back, tending to make marketers believe they’re not brand loyal. The truth is, Gen Z believes that brands should earn their loyalty. A brand’s ability to thrive, not just survive, is dependent on their willingness to go above and beyond for their customers. Power has shifted, and Gen Z, in particular, is well aware that the ball—so to speak—is in their court. The following brands are well on their way to building meaningful and long-lasting relationships with this sought-after age group. When you think of Taco Bell, many seemingly random things come to mind, from chihuahuas to Godzilla. Never afraid to try something new, Taco Bell has always taken the go big or go home approach. When it comes to reaching their consumers, Taco Bell knows that keeping their customers loyal means giving them more. Gen Z’s fast food chain of choice. 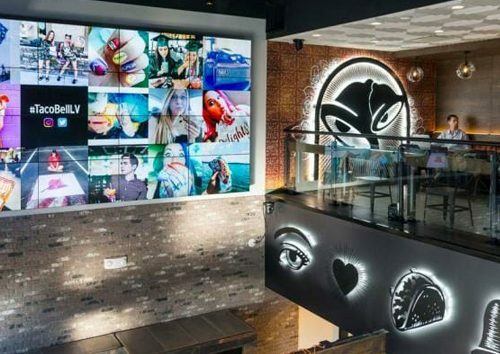 Recognizing this generation’s need for an immersive experience, Taco Bell’s new Las Vegas flagship store is an immersive experience abandoning the “one size fits all” model. The store resembles more a nightclub for teens than a typical fast food restaurant; it’s a full-fledged food experience. Stepping into the digital realm, the 55-year-old brand is now shifting its efforts towards the new kids on the block. They’re developing techbots—appropriately coined TacoBots—to place orders and Snapchat filters to turn consumers’ heads into giant golden tacos. 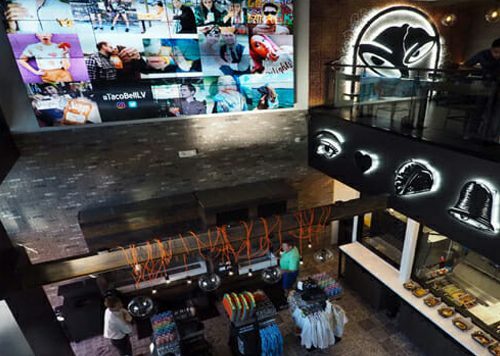 Taco Bell has seamlessly integrated technology into the very fabric of their brand. Well aware of this demographic’s digital adeptness, Taco Bell knows that immediacy and efficiency are crucial to retaining this market. The eatery and entertainment zone beautifully satisfy Gen Z’s insatiable need for original and share-worthy content. A customer favourite, Doritos tortilla chips have always been a crowd pleaser. The brand has never been one to shy away from experimentation, offering over 100 different varieties of flavours. It only seems fitting, then, that in preparation for Generation Z the brand has gone beyond flavour and begun experimenting with form and function. PepsiCo realizes that in order to get this cynical and jaded cohort to pick them off the shelf, offerings need to be authentic, unique and photo-worthy. PepsiCo Mexico Foods’ Doritos Incognita—chili and lemon-flavoured chips—does just that, taking packaging to another level. A reflection of the chip itself, the triangle-shaped bag turns into a snacking tray, making it both fun and functional. Easy to open, customers simply have to pinch from the top and pull all the way down. The design also allows one bag to easily fit against another and not only looks great on point-of-sale displays but is also vastly different from its competitors. 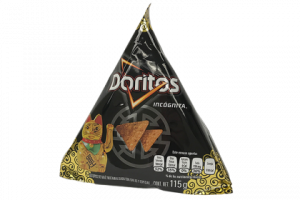 An innovative design, Doritos Incognita understands this generation’s need for new and exciting content and delivers it in a convenient, single-serving, easy-to-use package. With the majority of Generation Z not even old enough to own a credit card, it’s difficult to think of these youngsters as purchasing powerhouses. Their apathy towards brands and astuteness have them demanding more than any generation before them. They’re a tough crowd to please and an even tougher crowd to keep. Their business and loyalty will be dependent on a brand’s ability to provide fast, efficient and quality experiences. This isn’t just the beginning of a new generation of shopper, it’s the start of a whole new consumer approach. Have something to say? Drop us a line. A different kind of clickbait. We have a fishy school of thought. Dive into a better brand. You should have the tuna melt. Nothing fishy about these puns. Are you drowning in these puns?